Not to be confused with St James's Place. St James's Palace is the most senior royal palace in the United Kingdom. Located in the City of Westminster, although no longer the principal residence of the monarch, it is the ceremonial meeting place of the Accession Council and the London residence of several minor members of the royal family. Built by King Henry VIII on the site of a leper hospital dedicated to Saint James the Less, the palace was secondary in importance to the Palace of Whitehall for most Tudor and Stuart monarchs. 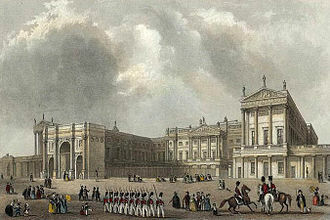 The palace increased in importance during the reigns of the early Georgian monarchy, but was displaced by Buckingham Palace in the late-18th and early-19th centuries. After decades of being used increasingly for only formal occasions, the move was formalised by Queen Victoria in 1837. Today the palace houses a number of official offices, societies and collections and all ambassadors and high commissioners to the United Kingdom are still accredited to the Court of St James's. Mainly built between 1531 and 1536 in red-brick, the palace's architecture is primarily Tudor in style. 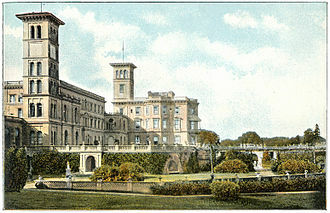 A fire in 1809 destroyed parts of the structure, including the monarch's private apartments, which were never replaced. Some 17th-century interiors survive, but most were remodelled in the 19th century. The palace was commissioned by Henry VIII, on the site of a former leper hospital dedicated to Saint James the Less. [n 1] The new palace, secondary in the king's interest to Henry's Whitehall Palace, was constructed between 1531 and 1536 as a smaller residence to escape formal court life. Much smaller than the nearby Whitehall, St James's was arranged around a number of courtyards, including the Colour Court, the Ambassador's Court and the Friary Court. The most recognisable feature is the north gatehouse; constructed with four storeys, the gatehouse has two crenellated flanking octagonal towers at its corners and a central clock dominating the uppermost floor and gable; the clock is a later addition, and dates from 1731. It is decorated with the initials H.A. for Henry and his second wife, Anne Boleyn. Henry constructed the palace in red brick, with detail picked out in darker brick. The palace was remodelled in 1544, with ceilings painted by Hans Holbein, and was described as a "pleasant royal house". 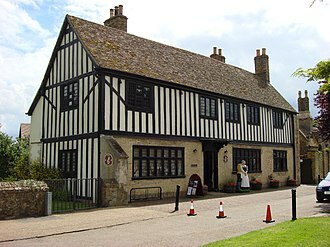 Two of Henry VIII's children died at Saint James's, Henry FitzRoy, 1st Duke of Richmond and Somerset and Mary I.  Elizabeth I often resided at the palace, and is said to have spent the night there while waiting for the Spanish Armada to sail up the Channel. St James's Palace, left, and The Mall, 1715. In 1638, Charles I gave the palace to Marie de Medici, the mother of his wife Henrietta Maria. 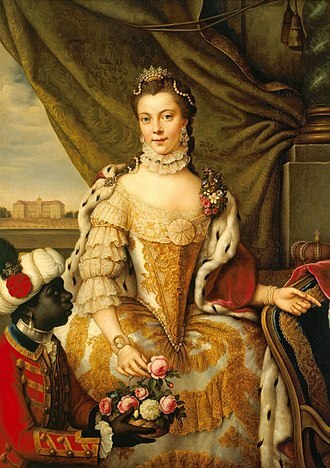 Marie remained in the palace for three years, but the residence of a Catholic former queen of France proved unpopular with parliament and she was soon asked to leave for Cologne. Charles I spent his final night at St James's before his execution. Oliver Cromwell then took it over, and turned it into barracks during the English Commonwealth period. Charles II, James II, Mary II and Anne were all born at the palace. 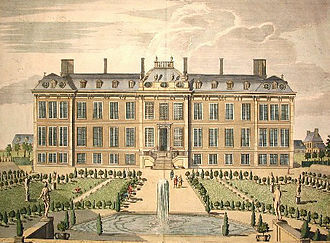 The palace was restored by Charles II following the demise of the Commonwealth, laying out St James's Park at the same time. 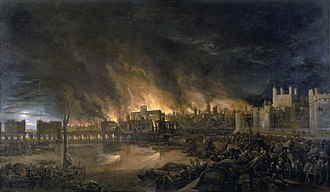 It became the principal residence of the monarch in London in 1698, during the reign of William III and Mary II after Whitehall Palace was destroyed by fire, and became the administrative centre of the monarchy, a role it retains. marriage of the future King George V (1893). Royal Collection. The first two monarchs of the House of Hanover used St James's Palace as their principal London residence. George I and George II both housed their mistresses, the Duchess of Kendal and the Countess of Suffolk respectively, at the palace. In 1757, George II donated the Palace library to the British Museum; this gift was the first part of what later became the Royal Collection. In 1809, a fire destroyed part of the palace, including the monarch's private apartments at the south east corner. These apartments were not replaced, leaving the Queen's Chapel in isolation, and Marlborough Road now runs between the two buildings. George III found St James's increasingly unsuitable. The Tudor palace was regarded as uncomfortable and too cramped for his ever-growing family. 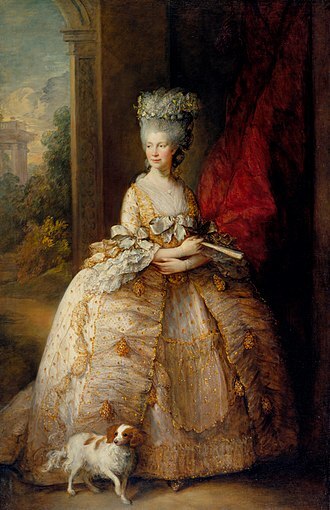 In 1762 George purchased Buckingham House – the predecessor to Buckingham Palace – for his queen, Charlotte of Mecklenburg-Strelitz  The royal family began spending the majority of their time at Buckingham House, with St James's used for only the most formal of occasions; thrice-weekly levées and public audiences were still held there. In the late 18th century, George III refurbished the state apartments but neglected the living quarters. Queen Victoria formalised the move in 1837, ending St James's status as the primary residence of the monarch. It was nevertheless where Victoria married her husband, Prince Albert, in 1840, and where, eighteen years later, Victoria and Albert's eldest child, Princess Victoria, married her husband, Prince Frederick of Prussia. 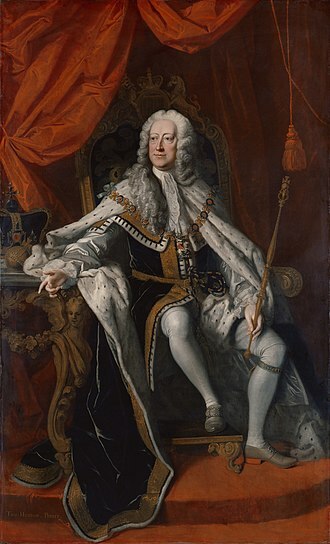 For most of the time of the personal union between Great Britain (later the United Kingdom of Great Britain and Ireland) and the Electorate of Hanover from 1714 until 1837 the ministers of the German Chancery were working in two small rooms within St James's Palace. The Second Round Table Conference (September – December 1931), pertaining to Indian independence, was held at the palace. On 12 June 1941, Representatives of the United Kingdom, Canada, Australia, New Zealand, the Union of South Africa, and of the exiled governments of Belgium, Czechoslovakia, Greece, Luxembourg, Netherlands, Norway, Poland, and Yugoslavia, as well as General de Gaulle of France, met and signed the Declaration of St James's Palace which was the first of six treaties signed that established the United Nations and composed the Charter of the United Nations. St James's Palace is still a working palace, and the Royal Court is still formally based there, despite the monarch residing elsewhere. It is also the London residence of the Princess Royal, Princess Beatrice of York, and Princess Alexandra. The palace is used to host official receptions, such as those of visiting heads of state, and charities of which members of the royal family are patrons. The Palace forms part of a sprawling complex of buildings housing Court offices and officials' apartments. The immediate palace complex includes York House, the former home of the Prince of Wales and his sons, Princes William and Harry. Lancaster House, located next-door, is used by HM Government for official receptions, and the nearby Clarence House, the former home of the Queen Mother, is now the residence of the Prince of Wales. The palace also served as the official residence for Princess Eugenie until April 2018. The nearby Queen's Chapel, built by Inigo Jones, adjoins St James's Palace. While the Queen's Chapel is open to the public at selected times, the Chapel Royal in the palace is not accessible to the public. They both remain active places of worship. The offices of the Royal Collection Department, the Marshal of the Diplomatic Corps, the Central Chancery of the Orders of Knighthood, the Chapel Royal, the Gentlemen at Arms, the Yeomen of the Guard and the Queen's Watermen are all housed at St James's Palace. Since the beginning of the 2000s, the Royal Philatelic Collection has been housed at St James's Palace, after spending the entire 20th century at Buckingham Palace. On 1 June 2007 the palace, Clarence House and other buildings within its curtilage (other than public pavement on Marlborough Road) were designated as a protected site for the purposes of Section 128 of the Serious Organised Crime and Police Act 2005. The effect of the act was to make it a specific criminal offence for a person to trespass into the site. ^ The uncertainty as to which Saint James was intended is expressed in the 1874 work Old and New London, where the author refers to the dedication as to "St. James the Less, Bishop of Jerusalem". James the Just, brother of Jesus, was referred to as Bishop of Jerusalem, not James the Less. ^ a b c d e Walford, Edward (1878). "St James's Palace". Old and New London: Volume 4. Institute of Historical Research. Retrieved 10 October 2014. ^ a b Wagner, John; Walters Schmid, Susan (2011). Encyclopedia of Tudor England. CA, USA: ABC Clio. pp. 1054–1055. ISBN 1598842994. ^ a b Perry, Maria (1999). The Word of a Prince: A Life of Elizabeth I from Contemporary Documents. Suffolk: Boydell Press. p. 14. ISBN 978-0851156330. ^ "St James's Palace: History". The British Monarchy. n.d. Retrieved 10 October 2014. ^ Wheatley, Henry; Cunningham, Peter (2011) . 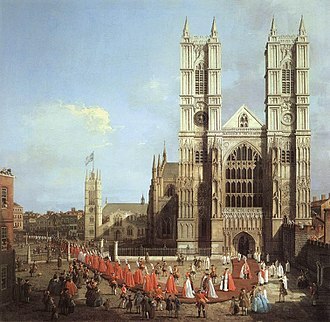 London Past and Present: Its History, Associations, and Traditions. Cambridge: Cambridge University Press. pp. 285–287. ISBN 1108028071. (Subscription required (help)). ^ Warner, George (1912). Queen Mary's Psalter Miniatures and Drawings by an English Artist of the 14th Century Reproduced from Royal Ms. 2 B. Vii in the British Museum (PDF). London: Britism Museum. p. n.
^ "Books and Manuscripts". Royal Collection. Retrieved 24 May 2011. ^ Nash, Roy (1980). Buckingham Palace: The Place and the People. London: Macdonald Futura. ISBN 978-0354045292. ^ Black, Jeremy (2004). George III: America's Last King. New Haven: Yale University Press. p. 174. ISBN 978-0300142389. ^ "1941: The Declaration of St. James' Palace". United Nations. Retrieved 28 March 2016. ^ a b c "St James's Palace: Today". The British Monarchy. n.d. Retrieved 10 October 2014. ^ Perry, Simon (1 May 2018). "Princess Eugenie and Her Fiancé Jack Brooksbank Just Moved Next Door to Harry and Meghan!". People. Retrieved 2 May 2018. ^ "Home Office Circular 018 / 2007 (Trespass on protected sites - sections 128-131 of the Serious Organised Crime and Police Act 2005)". GOV.UK. Home Office. 22 May 2007. Retrieved 18 July 2017. Wikimedia Commons has media related to St. James's Palace. Wolf Burchard, 'St James's Palace: George II and Queen Caroline's Principal London Residence', The Court Historian (2011), pp. 177–203. The British Museum is dedicated to human history and culture, and is located in the Bloomsbury area of London. The British Museum was established in 1753, largely based on the collections of the physician, the museum first opened to the public on 15 January 1759, in Montagu House, on the site of the current building. Although today principally a museum of art objects and antiquities. 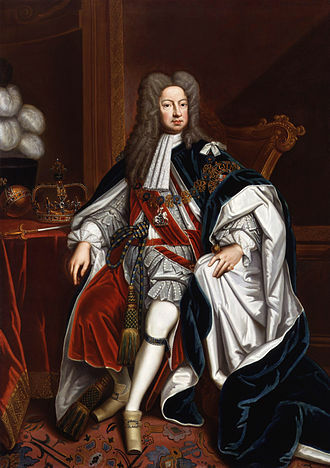 Its foundations lie in the will of the Irish-born British physician, on 7 June 1753, King George II gave his formal assent to the Act of Parliament which established the British Museum. They were joined in 1757 by the Old Royal Library, now the Royal manuscripts, together these four foundation collections included many of the most treasured books now in the British Library including the Lindisfarne Gospels and the sole surviving copy of Beowulf. 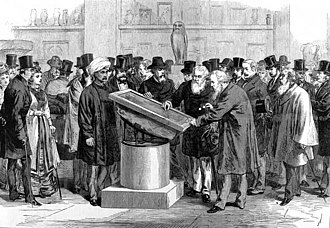 The British Museum was the first of a new kind of museum – national, belonging to neither church nor king, freely open to the public, sloanes collection, while including a vast miscellany of objects, tended to reflect his scientific interests. The addition of the Cotton and Harley manuscripts introduced a literary, the body of trustees decided on a converted 17th-century mansion, Montagu House, as a location for the museum, which it bought from the Montagu family for £20,000. The Trustees rejected Buckingham House, on the now occupied by Buckingham Palace, on the grounds of cost. With the acquisition of Montagu House the first exhibition galleries and reading room for scholars opened on 15 January 1759. During the few years after its foundation the British Museum received several gifts, including the Thomason Collection of Civil War Tracts. A list of donations to the Museum, dated 31 January 1784, in the early 19th century the foundations for the extensive collection of sculpture began to be laid and Greek and Egyptian artefacts dominated the antiquities displays. Gifts and purchases from Henry Salt, British consul general in Egypt, beginning with the Colossal bust of Ramesses II in 1818, many Greek sculptures followed, notably the first purpose-built exhibition space, the Charles Towneley collection, much of it Roman Sculpture, in 1805. A Chapel Royal is, in both Canada and the United Kingdom, an eccesiastical body of clergy and vestry officers appointed to serve the spiritual needs of the countrys reigning sovereign. In the UK, it is a department of the Ecclesiastical Household, the household is further divided into two parts, an ecclesiastical household each for Scotland and England, belonging to the Church of Scotland and the Church of England respectively. The latter was designated as a Chapel Royal in 2004 by Queen Elizabeth II and is under the jurisdiction of the Bishop of Ontario, in April 2016 the Queen approved in principle that St. Catherines Chapel, Massey College, Toronto be designated a Chapel Royal. In their early history, the English and Scottish Chapels Royal travelled, like the rest of the court, with the monarch, the first records of the Scottish Chapel Royal date from the eleventh century. James IV of Scotland established a building for the Chapel Royal in Stirling Castle in 1501, the Italianate building was used for the christening of Jamess son, Prince Henry. The English Chapel Royal had emerged as a body by the eleventh century. The chapel achieved its greatest eminence during the reign of Elizabeth I, the Master of the Children had, until at least 1684, the power to impress promising boy trebles from provincial choirs for service in the chapel. In the 17th century the Chapel Royal had its own building in Whitehall, in the 18th century the choristers sang the soprano parts in performances of Handels oratorios and other works. Under Charles II, the choir was augmented by violinists from the royal consort, at various times the chapel has employed composers, lutenists. The Chapel Royal refers not to a building but to an establishment in the Royal Household, the term is also, applied to those buildings used as chapels by the priests and singers of the Chapel Royal for the performance of their duties. The two currently regularly used British Chapels Royal are located in St. Jamess Palace in London, the Chapel Royal, since such establishments are outside the usual diocesan structure, they are classified as royal peculiars. Pall Mall /ˌpæl ˈmæl/ is a street in the St Jamess area of the City of Westminster, Central London. 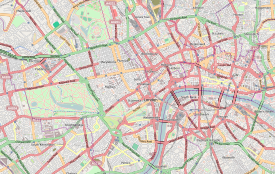 It connects St Jamess Street to Trafalgar Square and is a section of the regional A4 road, the streets name is derived from pall-mall, a ball game played there during the 17th century. The area was built up during the reign of Charles II with fashionable London residences and it became known for high-class shopping in the 18th century, and gentlemens clubs in the 19th. The Reform and Travellers Clubs have survived to the 21st century, the War Office was based on Pall Mall during the second half of the 19th century, and the Royal Automobile Clubs headquarters have been on the street since 1908. The street is around 0.4 miles long and runs east in the St Jamess area, from St Jamess Street across Waterloo Place, to the Haymarket, the street numbers run consecutively from north-side east to west and continue on the south-side west to east. It is part of the A4, a road running west from Central London. London Bus Route 9 runs westwards along Pall Mall, connecting Trafalgar Square to Piccadilly, Pall Mall was constructed in 1661, replacing an earlier highway slightly to the south that ran from the Haymarket to the royal residence, St Jamess Palace. When St. Jamess Park was laid out by order of Henry VIII in the 16th century, in 1620, the Privy Council ordered the High Sheriff of Middlesex to clear a number of temporary buildings next to the wall that were of poor quality. Pall-mall, a game similar to croquet, was introduced to England in the early-17th century by James I. The game, already popular in France and Scotland, was enjoyed by James sons Henry, in 1630, St Jamess Field, Londons first pall-mall court, was laid out to the north of the Haymarket – St James road. After the Restoration and King Charles IIs return to London on 29 May 1660, Samuel Pepyss diary entry for 2 April 1661 records that he. Went into St. Jamess Park, where I saw the Duke of York playing at Pelemele and this new court suffered from dust blown over the wall from coaches travelling along the highway. 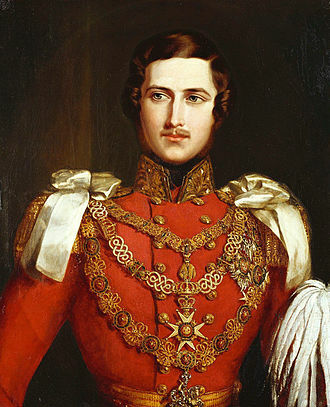 Prince Albert of Saxe-Coburg and Gotha was the husband of Queen Victoria. 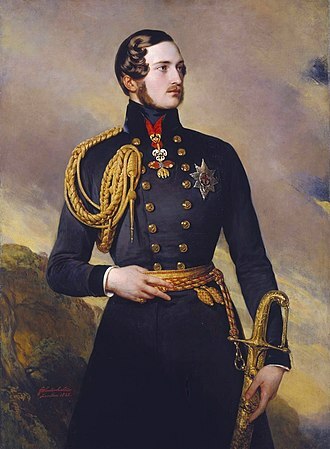 He was born in the Saxon duchy of Saxe-Coburg-Saalfeld to a family connected to many of Europes ruling monarchs, at the age of 20, he married his first cousin, Queen Victoria, they had nine children. He was heavily involved with the organisation of the Great Exhibition of 1851, the Queen came to depend more and more on his support and guidance. Albert died at the young age of 42, plunging the Queen into deep mourning for the rest of her life. Upon Queen Victorias death in 1901, their eldest son succeeded as Edward VII, Albert was born at Schloss Rosenau, near Coburg, the second son of Ernest III, Duke of Saxe-Coburg-Saalfeld, and his first wife, Louise of Saxe-Gotha-Altenburg. Alberts future wife, was earlier in the same year with the assistance of the same midwife. Albert was baptised into the Lutheran Evangelical Church on 19 September 1819 in the Marble Hall at Schloss Rosenau with water taken from the local river, in 1825, Alberts great-uncle, Frederick IV, Duke of Saxe-Gotha-Altenburg, died. His death led to a realignment of Saxon duchies the following year and Alberts father became the first reigning duke of Saxe-Coburg and his elder brother, spent their youth in a close companionship marred by their parents turbulent marriage and eventual separation and divorce. 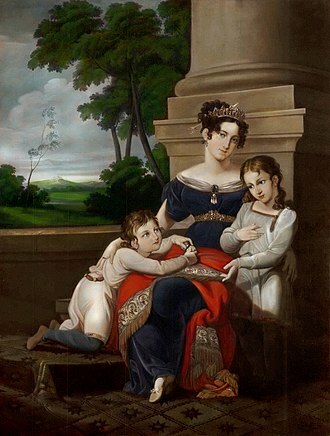 After their mother was exiled from court in 1824, she married her lover, Alexander von Hanstein, Count of Polzig and she presumably never saw her children again, and died of cancer at the age of 30 in 1831. The brothers were educated privately at home by Christoph Florschütz and studied in Brussels, like many other German princes, Albert attended the University of Bonn, where he studied law, political economics and the history of art. He played music and excelled at sport, especially fencing and riding and his tutors at Bonn included the philosopher Fichte and the poet Schlegel. By 1836, the idea of marriage between Albert and his cousin, had arisen in the mind of their ambitious uncle Leopold, at this time, Victoria was the heiress presumptive to the British throne. The House of Stuart, originally Stewart and, in Gaelic, Stiùbhart was a European royal house that originated in Scotland. The dynastys patrilineal Breton ancestors had held the office of High Steward of Scotland since the 12th century, the royal Stewart line was founded by Robert II, and they were Kings and Queens of Scots from the late 14th century until the union with England in 1707. Mary I, Queen of Scots was brought up in France and her son, James VI of Scotland, inherited the thrones of England and Ireland upon the death of Elizabeth I in 1603. Except for the period of the Commonwealth, 1649–1660, the Stuarts were monarchs of England and Ireland until 1707, of Great Britain and Ireland, in total, nine Stewart/Stuart monarchs ruled Scotland alone from 1371 until 1603. James VI of Scotland inherited the realms of Elizabeth I of England, following the Glorious Revolution in 1688, two Stuart queens ruled the isles, Mary II and Anne. Both were the Protestant daughters of James VII and II by his first wife, during the reign of the Stuarts, Scotland developed from a relatively poor and feudal country into a prosperous and centralised state. 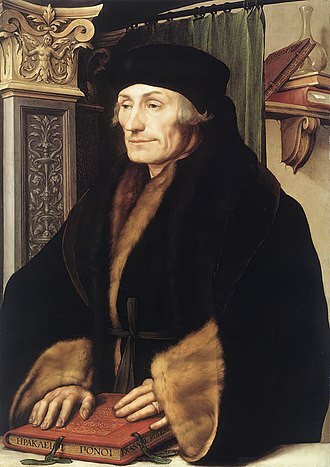 They ruled during a time in European history of transition from the Middle Ages, through the Renaissance, monarchs such as James IV were known for sponsoring exponents of the Northern Renaissance such as the poet Robert Henryson, and others. The name Stewart derives from the position of office similar to a governor. It was originally adopted as the surname by Walter Stewart, 3rd High Steward of Scotland. Prior to this, family names were not used, but instead they had patronyms defined through the father, the gallicised spelling was first borne by John Stewart of Darnley after his time in the French wars. During the 16th century, the French spelling Stuart was adopted by Mary, Queen of Scots, the FitzAlan family quickly established themselves as a prominent Anglo-Norman noble house, with some of its members serving as High Sheriff of Shropshire. It was the great-grandson of Alan named Walter FitzAlan who became the first hereditary High Steward of Scotland, another supporter of Matilda was her uncle David I of Scotland from the House of Dunkeld. 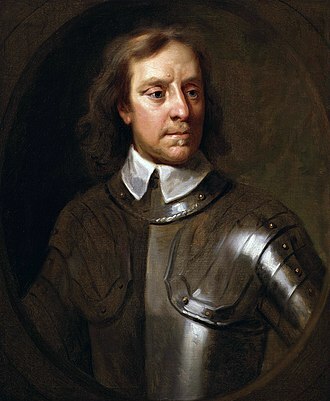 Oliver Cromwell was an English military and political leader and Lord Protector of the Commonwealth of England and Ireland. 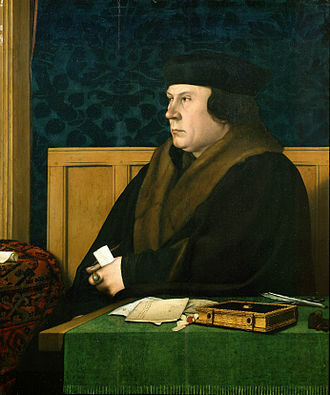 Cromwell was born into the gentry, albeit to a family descended from the sister of King Henry VIIIs minister Thomas Cromwell. Little is known of the first 40 years of his life as only four of his letters survive alongside a summary of a speech he delivered in 1628. He became an Independent Puritan after undergoing a conversion in the 1630s. He was a religious man, a self-styled Puritan Moses. He was elected Member of Parliament for Huntingdon in 1628 and for Cambridge in the Short and he entered the English Civil War on the side of the Roundheads or Parliamentarians. Cromwell was one of the signatories of King Charles Is death warrant in 1649 and he was selected to take command of the English campaign in Ireland in 1649–1650. Cromwells forces defeated the Confederate and Royalist coalition in Ireland and occupied the country, during this period, a series of Penal Laws were passed against Roman Catholics, and a substantial amount of their land was confiscated. Cromwell led a campaign against the Scottish army between 1650 and 1651, as a ruler, he executed an aggressive and effective foreign policy. He died from natural causes in 1658 and was buried in Westminster Abbey, the Royalists returned to power in 1660, and they had his corpse dug up, hung in chains, and beheaded. In a 2002 BBC poll in Britain, sponsored by military historian Richard Holmes was selected as one of the ten greatest Britons of all time. However, his measures against Catholics in Scotland and Ireland have been characterised as genocidal or near-genocidal, Cromwell was born in Huntingdon on 25 April 1599 to Robert Cromwell and Elizabeth Steward. 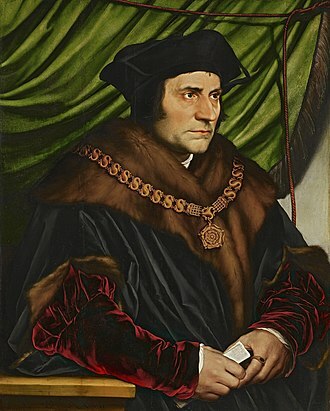 Katherine married Morgan ap William, son of William ap Yevan of Wales, Henry suggested to Sir Richard Williams, who was the first to use a surname in his family, that he use Cromwell, in honour of his uncle Thomas Cromwell. They had ten children, but Oliver, the child, was the only boy to survive infancy. Jasper was the uncle of Henry VII and great uncle of Henry VIII, Cromwells paternal grandfather Sir Henry Williams was one of the two wealthiest landowners in Huntingdonshire. Victoria was Queen of the United Kingdom of Great Britain and Ireland from 20 June 1837 until her death. From 1 May 1876, she adopted the title of Empress of India. Victoria was the daughter of Prince Edward, Duke of Kent and Strathearn, both the Duke of Kent and King George III died in 1820, and Victoria was raised under close supervision by her German-born mother Princess Victoria of Saxe-Coburg-Saalfeld. She inherited the throne aged 18, after her fathers three brothers had all died, leaving no surviving legitimate children. The United Kingdom was already a constitutional monarchy, in which the sovereign held relatively little direct political power. 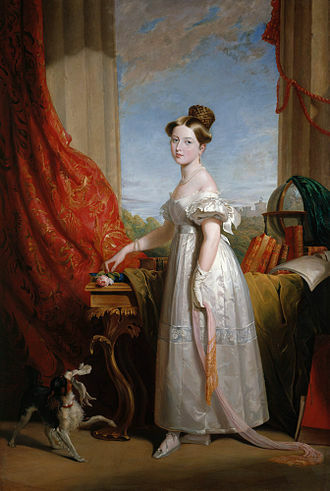 Privately, Victoria attempted to influence government policy and ministerial appointments, Victoria married her first cousin, Prince Albert of Saxe-Coburg and Gotha, in 1840. Their nine children married into royal and noble families across the continent, tying them together, after Alberts death in 1861, Victoria plunged into deep mourning and avoided public appearances. As a result of her seclusion, republicanism temporarily gained strength and her Golden and Diamond Jubilees were times of public celebration. 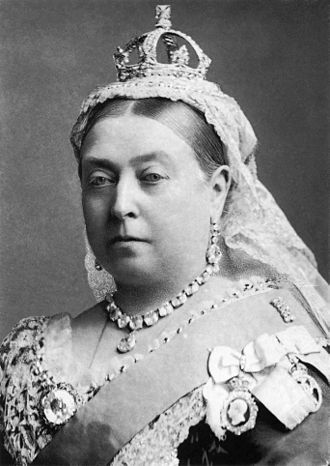 Her reign of 63 years and seven months is known as the Victorian era and it was a period of industrial, political and military change within the United Kingdom, and was marked by a great expansion of the British Empire. She was the last British monarch of the House of Hanover and her son and successor, Edward VII, belonged to the House of Saxe-Coburg and Gotha, the line of his father. Victorias father was Prince Edward, Duke of Kent and Strathearn, until 1817, Edwards niece, Princess Charlotte of Wales, was the only legitimate grandchild of George III. Her death in 1817 precipitated a crisis that brought pressure on the Duke of Kent. In 1818 he married Princess Victoria of Saxe-Coburg-Saalfeld, a widowed German princess with two children—Carl and Feodora —by her first marriage to the Prince of Leiningen and her brother Leopold was Princess Charlottes widower. The House of Tudor was a royal house of Welsh and English origin, descended in the male line from the Tudors of Penmynydd. Tudor monarchs ruled the Kingdom of England and its realms, including their ancestral Wales, the Tudors succeeded the House of Plantaganet as rulers of the Kingdom of England, and were succeeded by the House of Stuart. The first monarch, Henry VII, descended through his mother from a branch of the English royal House of Lancaster. The Tudor family rose to power in the wake of the Wars of the Roses and his victory was reinforced by his marriage to Elizabeth of York, daughter of King Edward IV, symbolically uniting the former warring factions under a new dynasty. 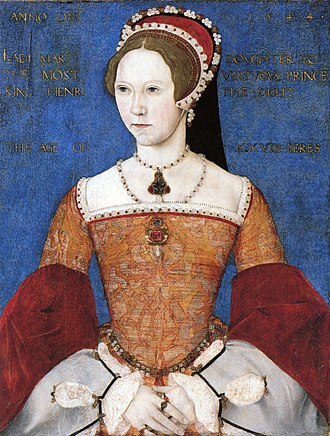 They maintained the nominal English claim to the Kingdom of France, although none of them made substance of it, after him, his daughter Mary I lost control of all territory in France permanently with the fall of Calais in 1558. 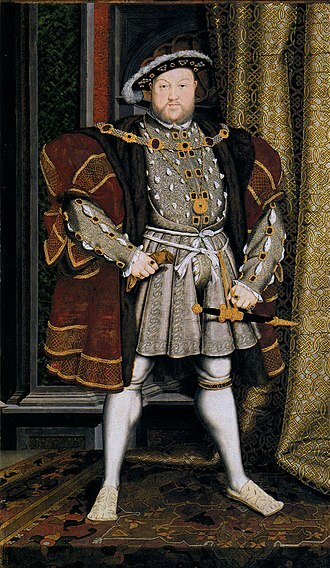 In total, five Tudor monarchs ruled their domains for just over a century, Henry VIII was the only male-line male heir of Henry VII to live to the age of maturity. Issues around the royal succession became major political themes during the Tudor era, the House of Stuart, descended from Henry VIIIs sister Margaret, came to power in 1603 when the direct Tudor line failed, as Elizabeth I died without a legitimate heir. The church retroactively declared the Beauforts legitimate by way of a bull the same year. A subsequent proclamation by John of Gaunts legitimate son, Henry IV, recognised the Beauforts legitimacy, the Beauforts remained closely allied with Gaunts legitimate descendants from his first marriage, the House of Lancaster. On 1 November 1455, John Beauforts granddaughter, Margaret Beaufort, Countess of Richmond and Derby, married Henry VIs half-brother Edmund Tudor and it was his father, Owen Tudor, who abandoned the Welsh patronymic naming practice and adopted a fixed surname. When he did, he did not choose, as was generally the custom, his fathers name, Owen Tudor was one of the bodyguards for the queen dowager Catherine of Valois, whose husband, Henry V, had died in 1422. London /ˈlʌndən/ is the capital and most populous city of England and the United Kingdom. Standing on the River Thames in the south east of the island of Great Britain and it was founded by the Romans, who named it Londinium. 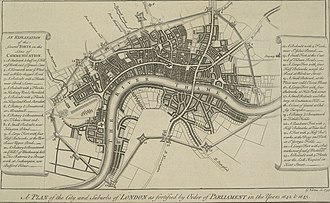 Londons ancient core, the City of London, largely retains its 1. 12-square-mile medieval boundaries. London is a global city in the arts, education, fashion, healthcare, professional services and development, tourism. It is crowned as the worlds largest financial centre and has the fifth- or sixth-largest metropolitan area GDP in the world, London is a world cultural capital. It is the worlds most-visited city as measured by international arrivals and has the worlds largest city airport system measured by passenger traffic, London is the worlds leading investment destination, hosting more international retailers and ultra high-net-worth individuals than any other city. Londons universities form the largest concentration of education institutes in Europe. In 2012, London became the first city to have hosted the modern Summer Olympic Games three times, London has a diverse range of people and cultures, and more than 300 languages are spoken in the region. Its estimated mid-2015 municipal population was 8,673,713, the largest of any city in the European Union, Londons urban area is the second most populous in the EU, after Paris, with 9,787,426 inhabitants at the 2011 census. The citys metropolitan area is the most populous in the EU with 13,879,757 inhabitants, the city-region therefore has a similar land area and population to that of the New York metropolitan area. 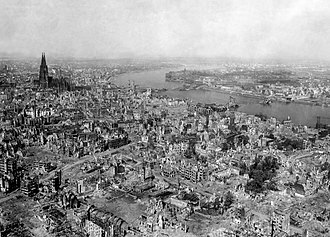 London was the worlds most populous city from around 1831 to 1925, Other famous landmarks include Buckingham Palace, the London Eye, Piccadilly Circus, St Pauls Cathedral, Tower Bridge, Trafalgar Square, and The Shard. The London Underground is the oldest underground railway network in the world, the etymology of London is uncertain. It is an ancient name, found in sources from the 2nd century and it is recorded c.121 as Londinium, which points to Romano-British origin, and hand-written Roman tablets recovered in the city originating from AD 65/70-80 include the word Londinio. 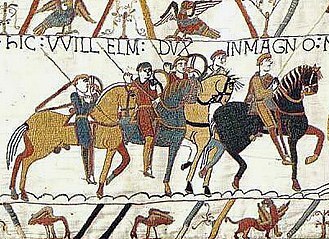 The earliest attempted explanation, now disregarded, is attributed to Geoffrey of Monmouth in Historia Regum Britanniae and this had it that the name originated from a supposed King Lud, who had allegedly taken over the city and named it Kaerlud. The United Kingdom of Great Britain and Northern Ireland, commonly known as the United Kingdom or Britain, is a sovereign country in western Europe. Lying off the north-western coast of the European mainland, the United Kingdom includes the island of Great Britain, Northern Ireland is the only part of the United Kingdom that shares a land border with another sovereign state‍—‌the Republic of Ireland. The Irish Sea lies between Great Britain and Ireland, with an area of 242,500 square kilometres, the United Kingdom is the 78th-largest sovereign state in the world and the 11th-largest in Europe. It is the 21st-most populous country, with an estimated 65.1 million inhabitants, this makes it the fourth-most densely populated country in the European Union. The United Kingdom is a monarchy with a parliamentary system of governance. The monarch is Queen Elizabeth II, who has reigned since 6 February 1952, other major urban areas in the United Kingdom include the regions of Birmingham, Glasgow and Manchester. The United Kingdom consists of four countries—England, Wales, the last three have devolved administrations, each with varying powers, based in their capitals, Edinburgh and Belfast, respectively. The relationships among the countries of the UK have changed over time, Wales was annexed by the Kingdom of England under the Laws in Wales Acts 1535 and 1542. A treaty between England and Scotland resulted in 1707 in a unified Kingdom of Great Britain, which merged in 1801 with the Kingdom of Ireland to form the United Kingdom of Great Britain and Ireland. Five-sixths of Ireland seceded from the UK in 1922, leaving the present formulation of the United Kingdom of Great Britain, there are fourteen British Overseas Territories. These are the remnants of the British Empire which, at its height in the 1920s, British influence can be observed in the language and legal systems of many of its former colonies. The United Kingdom is a country and has the worlds fifth-largest economy by nominal GDP. The UK is considered to have an economy and is categorised as very high in the Human Development Index. 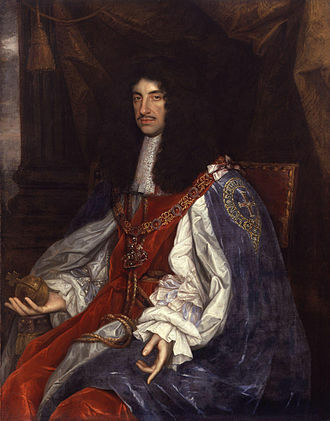 Charles II was king of England and Ireland. He was king of Scotland from 1649 until his deposition in 1651, Charles IIs father, Charles I, was executed at Whitehall on 30 January 1649, at the climax of the English Civil War. Cromwell defeated Charles II at the Battle of Worcester on 3 September 1651, Cromwell became virtual dictator of England and Ireland, and Charles spent the next nine years in exile in France, the Dutch Republic and the Spanish Netherlands. A political crisis followed the death of Cromwell in 1658 resulted in the restoration of the monarchy. On 29 May 1660, his 30th birthday, he was received in London to public acclaim, after 1660, all legal documents were dated as if he had succeeded his father as king in 1649. 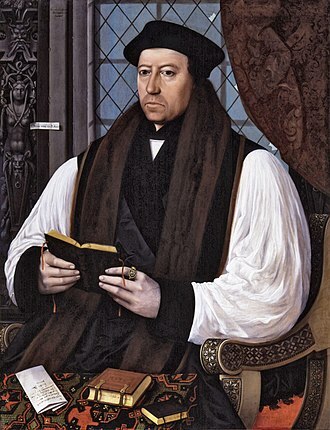 Charless English parliament enacted laws known as the Clarendon Code, designed to shore up the position of the re-established Church of England, Charles acquiesced to the Clarendon Code even though he favoured a policy of religious tolerance. 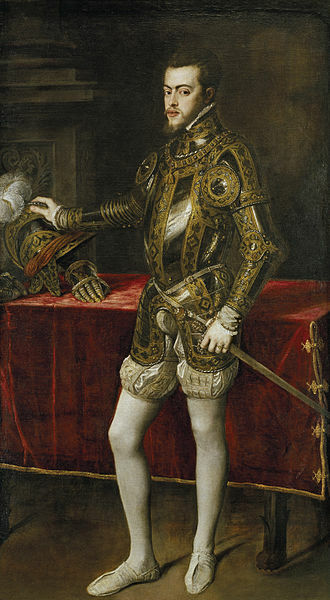 The major foreign policy issue of his reign was the Second Anglo-Dutch War. In 1670, he entered into the treaty of Dover. 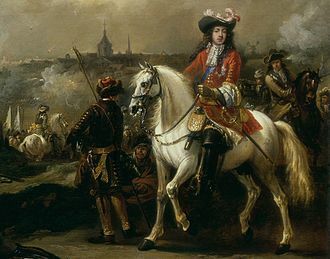 Louis agreed to aid him in the Third Anglo-Dutch War and pay him a pension, Charles attempted to introduce religious freedom for Catholics and Protestant dissenters with his 1672 Royal Declaration of Indulgence, but the English Parliament forced him to withdraw it. In 1679, Titus Oatess revelations of a supposed Popish Plot sparked the Exclusion Crisis when it was revealed that Charless brother, the crisis saw the birth of the pro-exclusion Whig and anti-exclusion Tory parties. 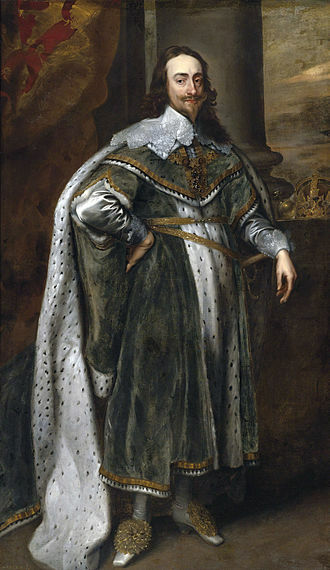 Charles sided with the Tories, following the discovery of the Rye House Plot to murder Charles and James in 1683, Charles dissolved the English Parliament in 1681, and ruled alone until his death on 6 February 1685. He was received into the Roman Catholic Church on his deathbed, Charless wife, Catherine of Braganza, bore no live children, but Charles acknowledged at least twelve illegitimate children by various mistresses. He was succeeded by his brother James, Charles II was born in St Jamess Palace on 29 May 1630. The Royal Collection is the art collection of the British Royal Family and the largest private art collection in the world. The Queen owns some objects in the collection in right of the Crown, the Queens Gallery at Buckingham Palace in London was built specially to exhibit pieces from the collection on a rotating basis. There is an art gallery next to the Palace of Holyroodhouse in Edinburgh. The Crown Jewels are on display in the Jewel House at the Tower of London. About 3,000 objects are on loan to museums throughout the world, few items from before King Henry VIII survive. 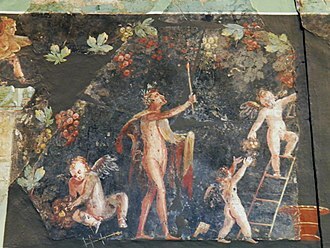 The most important additions to the collection were made by Charles I, a collector of Italian paintings. Many works have been given from the collection to museums, especially by George III and Victoria, in particular, most of the royal library was given by George III to the British Museum, now the British Library, where many books are still catalogued as Royal. The core of this collection was the purchase by James I of the collections of Humphrey Llwyd, Lord Lumley. Throughout the reign of Elizabeth II, there have been significant additions to the collection through purchases and through gifts from nation states. 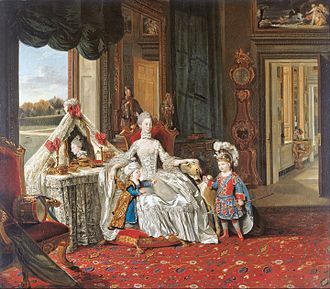 Numbering over 7,000 works, spread across the Royal Residences, numbering over 300 items, the Royal Collection holds one of the greatest and most important collections of French furniture ever assembled. The collection is noted for its range as well as counting the greatest cabinet-makers of the Ancien Régime. The Royal Collection is privately owned, although some of the works are displayed in areas of palaces, some of the collection is owned by the monarch personally, and everything else is described as being held in trust by the monarch in right of the Crown. All works of art acquired by monarchs up to the death of Queen Victoria in 1901 are heirlooms which fall into the latter category. Items the British royal family acquired later, including official gifts, ambiguity surrounds the status of objects that have come into Queen Elizabeth IIs possession during her reign. No. 4 St James's Place, from where Frédéric Chopin left for the Guildhall on 16 November 1848 for his last public performance. Doorway to Layer Marney Tower, showing the distinctive low Tudor arch and patterns in the brickwork. The Old Palace of Whitehall by Hendrick Danckerts, c. 1675. The view is from the west, in St. James's Park. The Horse Guards barracks are on the extreme left, with the taller Banqueting House behind it. The four-towered building left of centre is the palace gatehouse, the "Holbein Gate". Inigo Jones's plan, dated 1638, for a new palace at Whitehall. A sketch of Whitehall Palace in 1544, by Anton van den Wyngaerde. A plan of Whitehall Palace in 1680. The principal façade of Buckingham Palace, the East Front, was originally constructed by Edward Blore and completed in 1850. It was remodelled by Sir Aston Webb in 1913. The palace c. 1837, depicting the Marble Arch, which served as the ceremonial entrance to the Palace precincts. It was moved to make way for the east wing, built in 1847, which enclosed the quadrangle. Claude of France, wife of Francis I. Anne served as her maid of honour for nearly seven years. The Artist's Family, c. 1528. Oil and tempera on paper, cut out and mounted on wood. Kunstmuseum Basel. 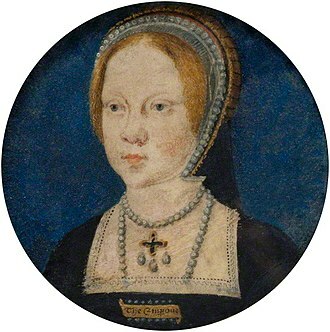 Mary at the time of her engagement to Charles V. She is wearing a rectangular brooch inscribed with "The Emperour". Portrait of Marie de' Medici as a young girl. María de Médici, by Frans Pourbus, c. 1606, Museo de Bellas Artes de Bilbao. Coronation of Marie de' Medici in St. Denis (detail), by Peter Paul Rubens, 1622–1625. 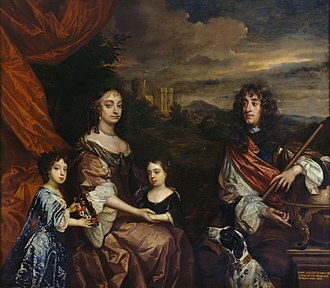 Henrietta Maria and King Charles I with Charles, Prince of Wales, and Princess Mary, painted by Anthony van Dyck, 1633. The greyhound symbolises the marital fidelity between Charles and Henrietta Maria. 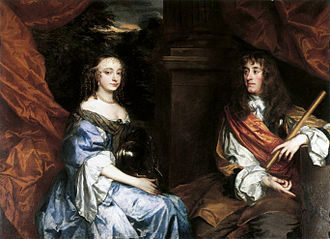 Henrietta Maria, with her court dwarf, Jeffrey Hudson. A monkey is usually symbolic of an advisor to fools, such as court dwarves, but in this case is believed to represent Henrietta Maria's menagerie of pets; the orange tree represents her love of gardens. 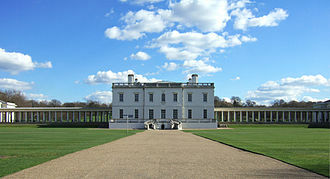 The Queen's House at Greenwich, completed under Henrietta Maria's sponsorship of Inigo Jones. The Duke of Monmouth was involved in plots against James. 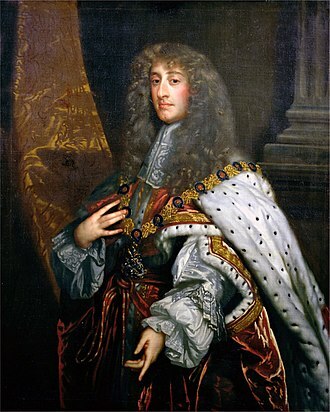 Mary's father, James II and VII, was the last Catholic monarch in Britain. Portrait by Nicolas de Largillière, c 1686. 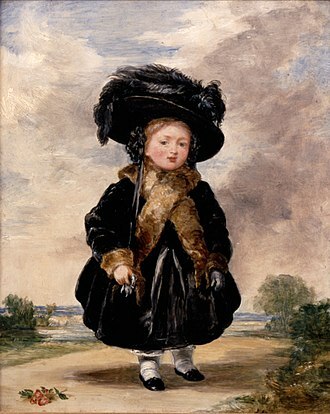 Portrait of a Boy Chorister of the Chapel Royal, c. 1873 by Richard Buckner. Victoria and Albert Museum, London. The Great Court was developed in 2001 and surrounds the original Reading Room. 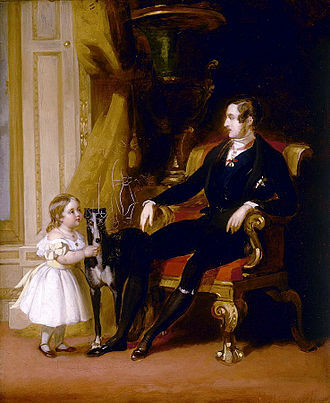 Victoria with her father Prince Albert and his greyhound Eos. Portrait by John Lucas, 1841. Victoria with her sisters Alice, Louise and Helena. Portrait by Franz Xaver Winterhalter, 1849. Pall Mall was one of the first streets in London to have gas lighting.